The United States has a continuously growing immigrant population. A problem for many of these New Americans may face is adapting to the new culture. Researchers have been investigating ways technology can play a role in supporting accultration of the immigrant population. In this work, we studied the fole of a particular class of technological support, hyper-local online communities, designed to support individuals living in the same geographical boundaries. 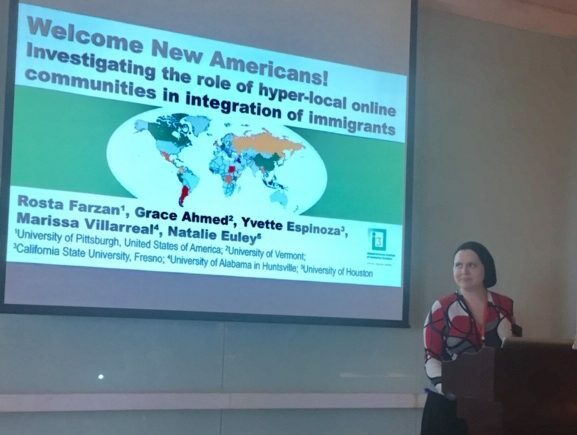 Through a survey of 50 immigrants from two distinct areas in the US, we investigated whether utilization of hyper-local online communities can be associated with better integration with the local community demonstrated as increased sense of belonging and satisfaction. We also investigaed potential factors contributing to utilization of such platforms. We report the results of our study; highlight potential implications for design of technology for immigrants, and discuss future directions of research in this area.